Recode has a nice graph slowing the sudden slow down in US and Canada social media users on Facebook (FB), Twitter (TWTR) and Snap (SNAP). 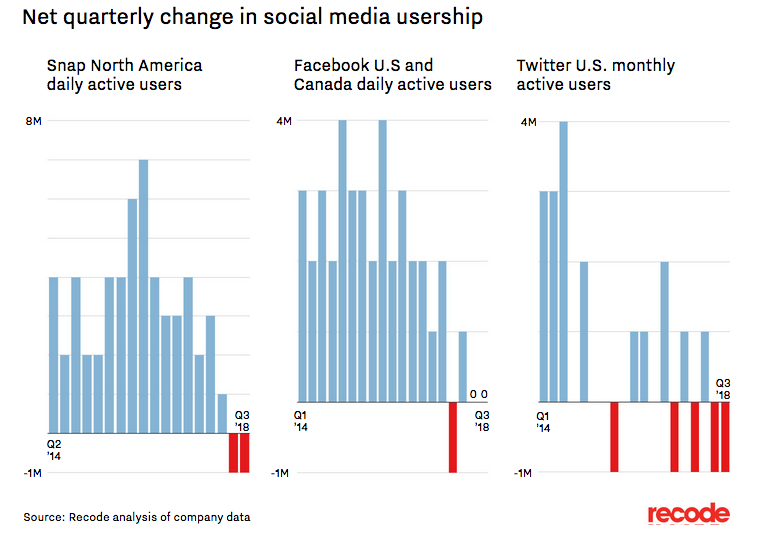 All 3 major platforms saw users decline during 2018. The question is whether any of these stocks offer investment opportunities in 2019. 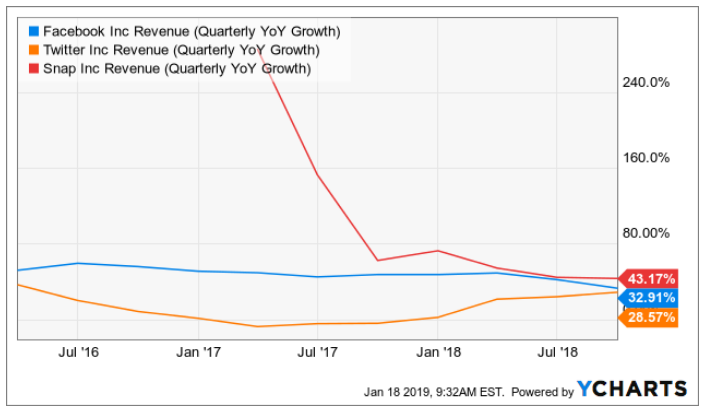 The one major difference in the platforms is that Twitter had problems going back years ago while both Facebook and Snap suddenly ran into growth issues last year. The below chart does lack scale as Twitter has far fewer users than Facebook. 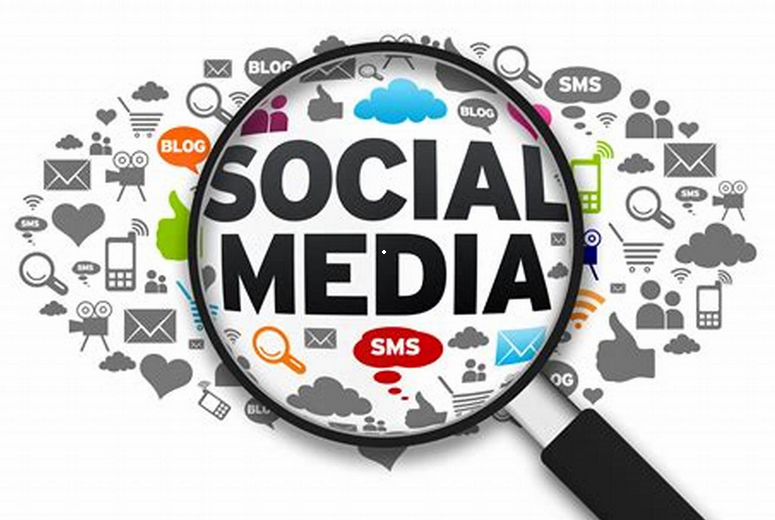 The scale difference is enormous between the 2.5 billion global MAUs on Facebook and the 330 million MAUs on Twitter. In this sense, Twitter still remains my favorite growth story in the sector due to this huge potential to close the gap as the social media site increasingly becomes the place to find out "What's Happening" in the world. 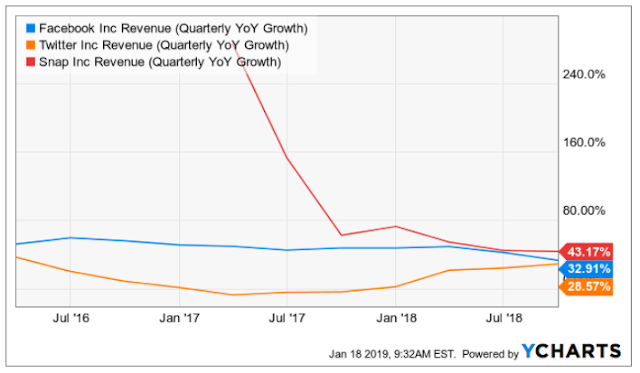 What really matters for a stock is the revenue trend. Investors not paying attention still see Facebook and Snap as the faster growing stocks, but Twitter is on pace to take the lead. The growth numbers at Snap aren't even relevant, as long as the company continues burning cash at an alarming rate. Twitter remains the stop pick in the sector with the potential to close the user and revenue gap with Facebook. Facebook is a relatively cheap stock here below $150 while Snap is one to avoid with the CFO suddenly leaving.